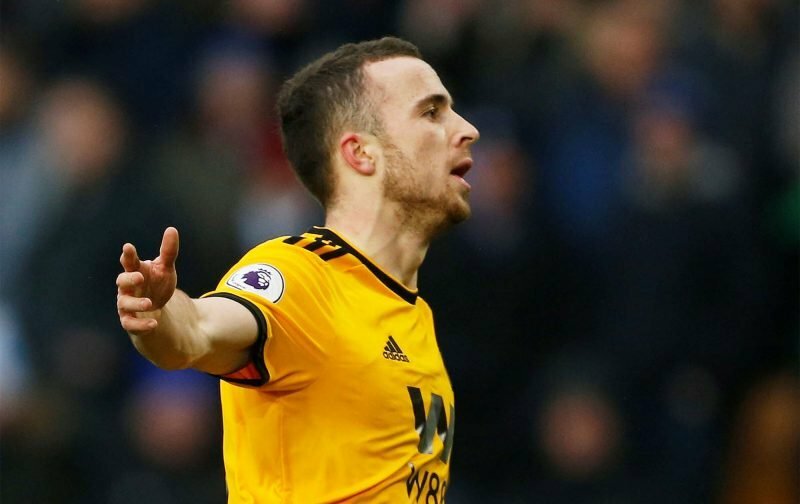 Wolves win against Leicester on Saturday came in one of the most exciting Premier League games of the season and kept Wolves well on course for a top half finish. From a 2nd minute shot from Neves tipped over the bar by Schmeichel to a last minute winner by Jota this was football entertainment at its best as the momentum switched from one team to the other and we were well into the 93rd minute before anyone had a clue where the points were going to end up. The game was played at a high pace with plenty of goalmouth incidents and a fair chunk of controversy, and like the last time Wolves beat the same team 4-3 in 2003 it was a game that will stay in the memory for a long time. That game over 15 years ago came when both teams were struggling for survival in the top flight. Leicester, who went into the game bottom of the league, were 3 up at half time, but two goals from Colin Cameron, a header from Alex Rae and a close range finish by Henri Camara turned the game around. This time it was Wolves who set the early pace with goals from Jota and Bennett in the opening 12 minutes. Leicester though drew level with two goals in the first six minutes of the second half. Only for Jota to restore Wolves lead midway through the second half, before Wes Morgan seemingly rescued a point for the visitors in the 87th minute. But Molineux was in raptures when Jota won the game in the 93rd minute for a vital win between two clubs battling for a top half finish. There was controversy surrounding the winning goal. Jota was around 8 yards offside when Neves played the ball forward to Jimenez on the right, and when he crossed to Jota the striker was by then onside and the goal was legitimate. Then Nuno came onto the field to celebrate just as Klopp had done when Liverpool won the recent Merseyside derby with a late goal. Unlike Klopp, Nuno was sent off and although many love to see managers showing passion for success, rules are rules and Nuno will likely be punished. Klopp was ultimately fined £8,000 for his intrusion and Nuno will likely get something similar. A touchline ban would surely be harsh. The game saw plenty of fine individual performances on both sides but for Wolves the real positives of the day were to see Jota and Neves right at the top of their game. Jota didn’t open his Premier League scoring account until his 15th appearance of the season but has been in sparkling form since that winner against Chelsea. He scored 17 times in last season’s Championship winning season and is now looking capable of being a regular scorer at this level. Now that Wolves have changed their formation from 343 to 352 he is pushed further forward in support of Raul Jimenez and Wolves look much more potent in the attacking third than they have been doing for much of the season. Neves in my mind has had a good season but been playing a more conservative game than we saw from him last season. Not much of the 50 yard pinpoint passes or long range shots, but plenty of ball winning, link up play and developing a partnership with the more experienced Moutinho. But in the recent cup game against Liverpool and on Saturday against Leicester we have seen his more expansive game that is a joy to watch. His goal against Liverpool and the early long range shot on Saturday is a reminder of his long range shooting ability and the range of passing we saw on Saturday removed any doubt that he can become a star at the highest level. The passes that set up the 3rd and 4th goals on Saturday were simply superb and worth the price of admission alone. Wolves now find themselves in a mid-table mini league that looks likely to see them finish somewhere between 7th and 13th. Even 13th would be the highest they have ever finished in the Premier League. But all the indications are that they will finish higher than that. The next 4 games will be key in that mini league when they play West Ham and Newcastle at home, and Everton and Bournemouth away. Win 2 or 3 of those and a top half finish will look very much on the cards. Then they will need to put to bed their two worst performances of the season when they face return fixtures against Huddersfield and Cardiff. Before that its a trip to Shrewsbury for an FA Cup 4th Round tie. That has to be a winnable game and since the 3rd Round win over Liverpool followed by the 4th round draw, there is a growing appetite from supporters for a cup run. Nuno will have to get the balance right in team selection that will need to show Shrewsbury due respect, but keep the team fresh and prepared for the important league game at Molineux next Tuesday against West Ham. Wolves supporters will trust Nuno to get that decision right. I have yet to see anyone commenting on the foul on Jonny in the area that led to Leicester’s second goal, or the Man City first goal that was identical to our fourth, I wonder how many of those moaning would have moaned had it been the other way round!